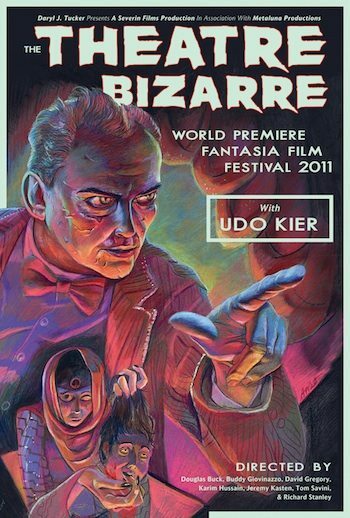 The 15th Annual Fantasia International Film Festival proved the perfect delivery room for the year-a-half birthing process of Severin’s co-production mega-omnibus spectacular The Theatre Bizarre. 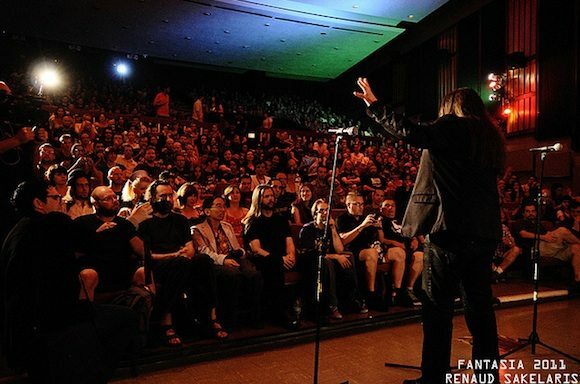 With the due date scheduled for Saturday July 16th, Fantasia’s home ville of Montreal opened its arms to enthusiastically accommodate TB’s massive roster of directors, stars, producers and key crew members. 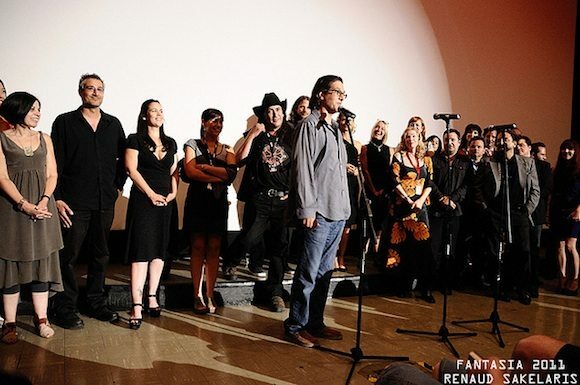 The festival generously provided a once-in-TB’s-lifetime chance for all seven of its directors – Douglas Buck, Buddy Giovinazzo, David Gregory, Karim Hussain, Jeremy Kasten, Tom Savini, and Richard Stanley – to congregate in a solitary spot. And as the filmmakers winged in from across the globe, one could sense that TB was indeed temporarily taking over the festival. If you walked into any coffee shop, restaurant, or watering hole you were greeted by the heart-masticating head of Sweets’ Lindsay Goranson, whose face graced the front cover of local Arts juggernaut The Mirror (below). Aside from The Mirror’s cover story, pre-Premiere press coverage included an interview in The Gazette with local faces Karim Hussain and Douglas Buck, a Fangoria chat with Buddy Giovinazzo and one in Fantasia’s own Spectacular Optical with David Gregory. The star power was ladled out in megawatts by TB’s two resident genre legends Udo Kier and Lynn Lowry, who descended upon Fantasia as thunderous, glorious reminders of horror’s halcyon past. One flash of the incandescent eyes of Kier informed festival-goers that, yes, TB was taking no prisoners and giving no cinematic quarter. Finally, the moment arrived, with the Premiere filling to the brim the festival’s 750-seat main theater. Fantasia mastermind Mitch Davis personally helmed the proceedings, giving a seat-rattling introduction that whipped attendees into a frenzied, frothy merengue of anticipation. The film did not disappoint, thrilling, chilling, and belly-aching viewers with its phantasmagoric array of visions, both stained and un-stained. After one of the most populated Q&A’s this side of Cecil B. DeMille, the small army of TB-ers decamped for a raucous after-party at Montreal’s legendary indie-cinema Blue Sunshine. Debates ran hot and heavy within Blue Sunshine’s sweaty, un-air-conditioned walls, as people proclaimed which episodes were their personal favorites. But one opinion reigned supreme; that the screening had been an unqualified success. The TB-onslaught was brought to an end the following afternoon, as all seven directors served as panelists on Jovanka Vuckovic’s discussion The Architects of the Bizarre. All that was left was to attend one more night of heavy drinking and limited edition poster signing, before the TB battalions departed, re-spreading across the hemispheres. In conclusion, a million-and-one thanks are aimed at Mitch Davis and his tireless Fantasia team, for giving The Theatre Bizarre a send-off that exceeded its wildest, most Grand Guignol-suffused dreams. Next up London’s Frighfest and the Paris Festival De L’etrange. 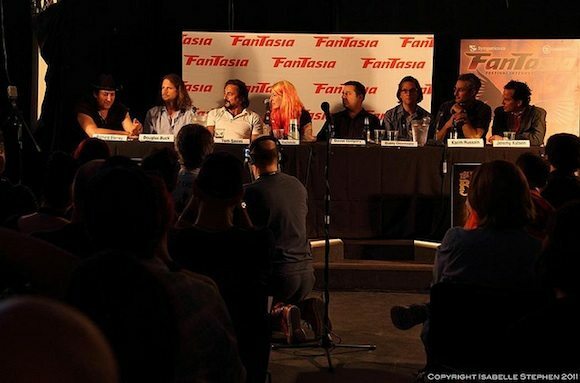 For a complete photo gallery from the Fantasia premiere click here, and for a complete gallery from the directors panel click here.